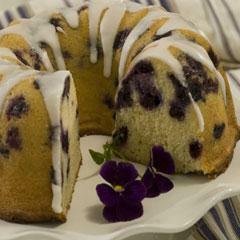 Bursting with fresh blueberries and draped with a lemon glaze, this cake is ideal for breakfast, brunch or dessert. Combine 3 cups flour, baking powder, salt and baking soda in medium bowl with wire whisk; set aside. Beat Country Crock® Calcium plus Vitamin D with 2 cups granulated sugar in large bowl with electric mixer until light and fluffy, about 5 minutes. Add eggs, one at a time, beating well after each addition. Beat in 2 teaspoons vanilla, scraping sides occasionally. Alternately beat in flour mixture and sour cream on low speed, just until blended, beginning and ending with flour mixture. Combine remaining 1/4 cup granulated sugar with blueberries. Gently fold blueberry mixture into cake batter. Spoon batter into prepared pan. Bake 55 minutes or until toothpick inserted in center comes out clean. Cool on wire rack 15 minutes. Remove cake from pan and cool completely. For glaze, blend confectioners sugar, lemon juice, lemon peel and remaining 1/2 teaspoon vanilla in medium bowl; drizzle over cake. ** Also delicious with Country Crock® Calcium plus Vitamin D.